We are living in a time that is facing deep and rapid social changes. These changes are a reaction to social conflicts, both within states and beyond them. Whether it is a matter of a social order under the condition of a capitalist system, new technological possibilities or a global order in the face of scarce resources, climate change and armed conflicts – we are confronting challenges of a new kind that question the traditional conceptions of order. Our society is based upon orders of justification that privilege some with certain legitimations and the power of representation. This authority is questioned by an increasing number of people. 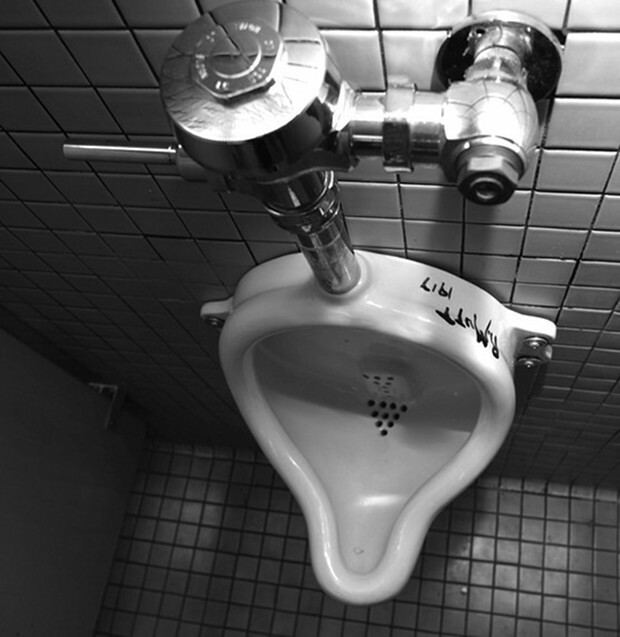 The proposal of the artist Tania Bruguera to put Duchamp`s urinal back into the restroom describes very metaphorical the claim that socially engaged art has: This way of understanding art has nothing to do with decontextualization of objects in order to understand a concept, in contrary, socially engaged art is about concrete problems, humans, conditions, communities. It does not represent an abstracted idea but transforms the idea into action. It is about establishing a difference in art between representing what is political and acting politically. Socially engaged art deals with explicit conditions and does not remain in the level of association. An important source are social movements as the AIDS activism, women’s right movement, the civil rights movement but also community work . The topics are specific but deal a lot with exclusion of minorities (women, migrants, ethnic groups, states…etc.) and the lack of their representation. It is almost impossible to measure the impact and value on an artistic scale or market index with old-fashioned indexes as the aesthetic experience is over and social transformation has priority . It transcends the field of art, entering daily life without knowing how big the real impact will be in the end. It is not just about raising awareness, but about being uncomfortable, sharing knowledge, and affecting local situations. Why is art the appropriate medium to lead to social change? First of all, one has to break with the stereotype in people’s head that art is something that just belongs to cultural institution and works exclusively in an exhibition format. The history of political art shows that movements as Fluxus, Dada, Surrealists, Futurists etc. developed strategies, as happenings and performances, to express disobedience and resistance against the bourgeoisie and the established system. One characteristic was that art was not longer reduced to an object but to the experience of the action in-situ. The new definition of art is that it rather encompasses gestures that the artist has conceived specifically for it, repeating actions, ethical views, political decisions and economic considerations in his or her project. This new development leads to the fact that it became very difficult to expose these strategies out of their context, especially in the political field, without forcing a museification and turning the strategy into a meaningless tool in an archive box. Art is not longer a privilege of art institutions! Art can be understood as a tool kit for social change to answer the big question: What is our role and responsibility within this global reality? There are different ways to address this fundamental question. One possibility is the material solution where social or political issues are translated into material resolutions that provide necessary and different points of entry into complex ideas. The creative dimension of art can also be used to bring a group of like-minded people together and develop specific strategies/actions as a collective – a micro society. Socially engaged art is lead by the strong desire to connect daily life and art and change specific conditions with creative tools. The difference between art and activism is obsolete as art is redefined by the dynamics of the actions. For art historian, theorist and curators it is quit difficult to theorize it, as the art specific aesthetic quality is secondary and other fundamental questions are raised: What is the social impact? Which tool/strategy has to be developed for a specific condition? Does empowering individuals really increase their social and political participation and therefore lead to participatory processes of change? What skills and supports are needed to build sustainable practices that operate within this context? Do the roles of artists and their position in society change when they explicitly refer to societal or political issues? (1) cannot be reduced to an object anymore but development of long-term tools and strategies (2) collective authorship: the formation of local communities, geographical bonds and the building of alliances to reinforce activism are of central importance. Instead of creating an individual object, a group of people tries to find strategies to change something. (3) site specificity: the projects act in local conditions/communities. The concrete examples for socially engaged art are indefinite. But to exemplify the theoretical part I would like to introduce a variety of projects within. As you can see the projects are filled with further links so that everyone with further knowledge can scroll through. Tania Bruguera Arte útil (useful art) “Immigrant Movement International” Queens Museum. Aim: Empowerment of excluded communities. An interesting project is the “non participation project” of the artist Lauren van Haaften-Schick where she calls for letters by artists, curators, and other cultural producers, written to decline their participation which run counter to their stated missions. There are many reasons to decline cooperation with an institution: The process of exclusion of minorities: women, ethnic groups, classes, states…etc. in the curatorial programming. The “no” to such cooperation is a highly political act and shows that it is not just about projects you do but also projects you will not do. Leonidas Martin member of the Spanish collective enmedio who develops creative strategies/actions to face the crisis in Spain. Aim: Strengthen the collective thinking in times of crisis in Spain. One action, which exemplifies the combination of interventionist tactics and politically engaged artistic practice, is Evictions Are Not Numbers, They Are Faces and Eyes (2012). 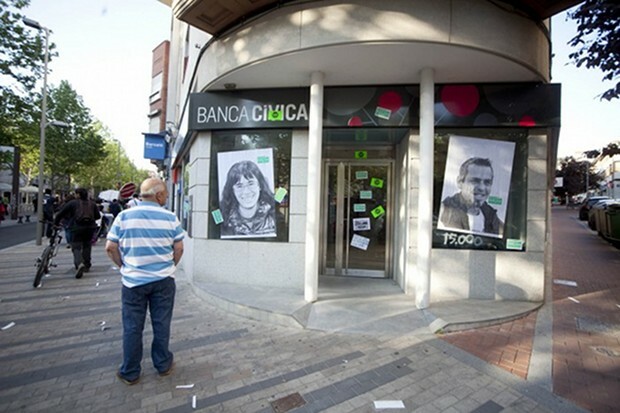 For this action, which took place on the one-year anniversary of the first M15 protests, members of Enmedio pasted portraits of evicted Spaniards onto the storefront windows of banks around the country. The large photographs put faces to the names of those that the banks would not or could not support, frankly embodying the consequences of the financial crisis. ABOUT THE AUTHOR: Anabel Roque Rodriguez is a curator and writer. Her research focus is: Feminism, Art activism; questions of representation; territoriality; temporary artistic occupations, and the politicization of space in Contemporary Art. “[...] Ich denke, was die Erfahrung von Occupy sicherlich deutlich gemacht hat, ist, dass die Frage von Protest heute keine Frage mehr von klaren Positionen ist. Es ist bei weitem nicht klar, wer der Gegner ist, gegen wen und was es zu protestieren gilt. [...] Gleichzeitig wenn es darum geht wie Protest weiter geht, haben natürlich auch im Laufe der Bewegung von Occupy die Institutionen der Macht dazu gelernt. Wenn ich daran denke, in den USA wurden zahlreiche Bestimmungen über die Nutzung von öffentlichen Plätzen aber auch über die Abhaltung von politischen Demonstrationen doch wesentlich verschärt.